Now that I have about 200 miles on my Topo Runventures, it’s time to tell you about them. Weighing in at 7.5 oz (my size) with a 2 mm drop these trail shoes have certainly impressed me. Topo Athletic is relatively new to the scene but they are making waves by providing high-quality shoes while utilizing feedback received from athletes to constantly improve their line. 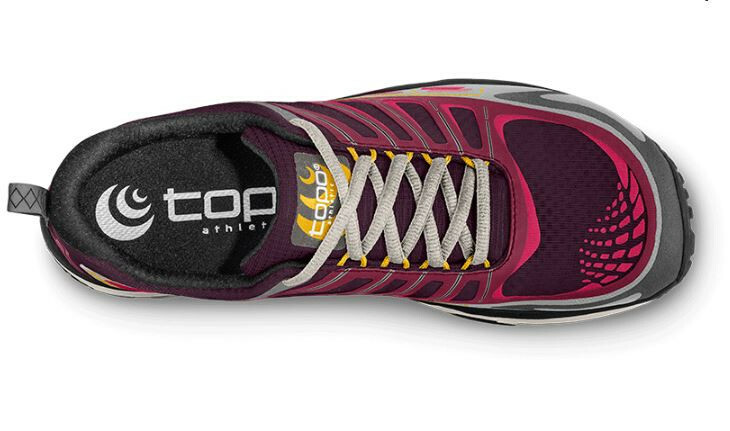 Topo Athletic’s main feature is the wide toe box on their full line of shoes. 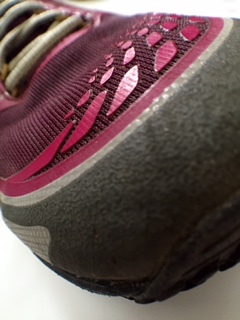 As a runner with small, narrow feet I never saw a need to have a roomy toe box, and instead opted for that snug fit. After long training runs and races on trails my feet – especially my toes – would ache. I thought this was part of ultra running and shrugged it off. Now that I’ve been running in Topo shoes I realize that my toes don’t have to, and shouldn’t, hurt after long runs. I will admit that I was skeptical of having a wide toe box on a trail shoe. Surely there would be slippage either laterally, into the front of the shoe, or both. This isn’t the case for me. In lacing the shoes I still get that snug fit through the midfoot and the heel is comfortably snug as well. The upper is made of a durable, dual layer, rip & abrasion resistant mesh. I have put quite the beating on these shoes and so far the upper is showing no signs of wear or weakness. The dual layer has an added bonus of helping to keep debris out, but at the same time allowing breathability. Another detail I find very useful is the ample toe bumper. I’m not the most graceful runner on trails so between the roomy toe box and the sturdy rubberized cap my toes have not complained once! 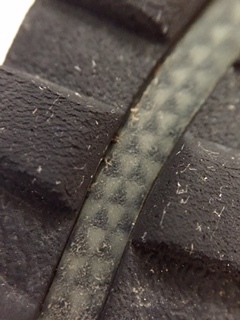 A stand-out feature on this model is the midsole which includes compressed EVA on top of a full length TPU rock plate (which you can see at various spots on through the outsole). In New Mexico I encountered sharp rocky terrain that I do not see as much on my local trails. Not once did I find a “soft spot” on the shoe where I could feel sharp rocks. 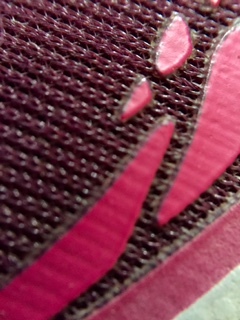 I was most skeptical about the outsole of the Runventure. Mainly because I have been accustomed to trail shoes with aggressive soles and deep lugs. During my first true test – a technical run in wet conditions – I started out holding back on the wet rocks and descents. However I quickly gained trust once I found that these shoes had great traction and before long I was pushing the envelope to truly test their grit. I was pleasantly surprised (and relieved) by their performance. They may lose some traction on super muddy or loose terrain but in exchange they maintain the minimal ground feel. When I raced at TNF 50k it was a mudfest. At times I was wishing I had a lugged shoe with more traction to get through that muck, but quickly realized that I was happy to not be carrying around the extra weight of mud caked into the tread. The Topo Runventure offers a ton of protection in every area of the shoe while also maintaining a light weight and minimalist feel. I even heard that Maggie Guterl raced in the Runventures at The Georgia Death Race, where she earned her Golden Ticket to Western States! If that’s not a testament to these shoes… Congrats Maggie! 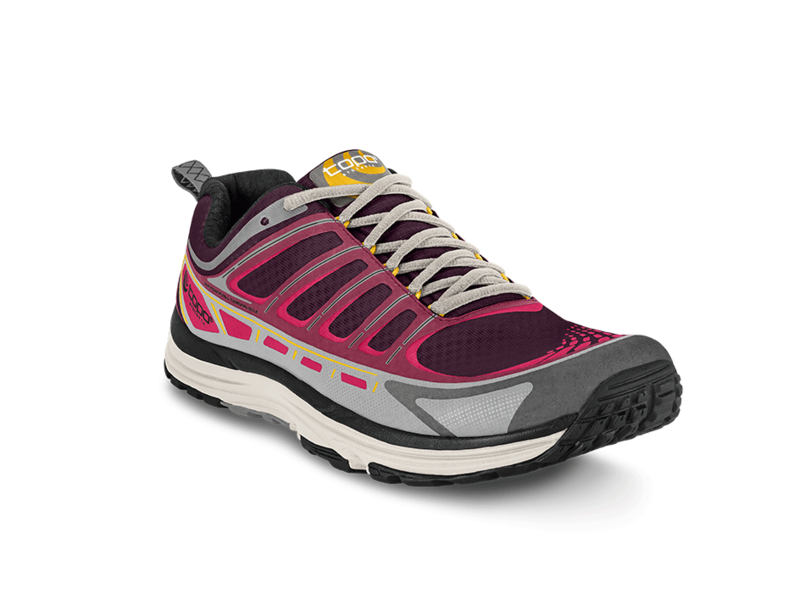 If you’re interested in trying the Topo Runventure, or any of Topo Athletic’s shoes, you can use code TOPOKLINE20 for 20% off your order. If you want to know more about any of their shoes feel free to contact me! 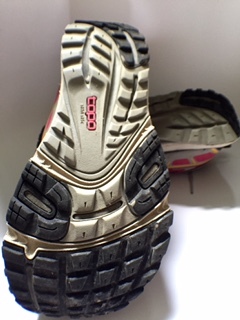 This entry was posted in product review, Topo and tagged Runventure, Topo, trail running, trail shoe, trail shoe review by lljkline. Bookmark the permalink.